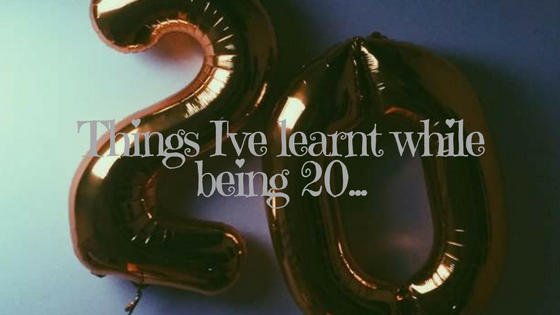 Things I’ve learnt while being 20! So next month I will be 21, which is slightly crazy seen as I have friends who are getting married either this year or next and I still feel (and look) like I’ve just turned 16 (oh how simpler life was the summer after GSCE’s)! I didn’t want to do a typical ’20 things I’ve learnt while I’m 20′ post, even those there’s nothing wrong with them but I wanted to do ‘things I’ve learnt while being 20’, which I feel has been a foundation year in almost defining myself (I say almost because who even really likes labels… not me!!). 1. If you try your hardest, you will get to where you want to go! I’ve tried 3 times to get into uni and this is the first time I actually have a place and I am going!! It hasn’t been easy in the slightest but I’ve tried and tried, with a lot of tears and time and now I can say it’s finally paying off!! Have I wanted to give up? 100% and on most days but I feel like I’ve finally found a degree that is for me. 2. Alone time is good for you (for me)! If you know me at all, you know that I get easily drained from being around too many people for a prolonged amount of time, don’t get me wrong, I love a good gathering or even just meeting for lunch but I also love time to myself! To be able to read or listen to music or knit and just recharge a little and it’s only just recently I’ve learned this about myself! ⁃ No wonder I used to get so grumpy, I never took any time to have good old fashioned ‘me time’. I’ve also learnt that this is okay. I use to force myself to do things and wonder why I was in a bad mood but getting to know this about myself, allows me to prevent bad moods occurring. 3. Your friends still love you, even if you don’t talk as often as you used to! I’m incredibly lucky to have friends from here and there, I joke (but it’s true) that I like to ‘collect’ other people because who knows if you’re going to find a piece of you in them? People are incredible. You could’ve been friends for 12 years or for 12 weeks and have a completely different connection with them both! I have a friend from when I was 3, a friend from primary school days, friends from when I was 16, friends from church, friends from now, even friends from a Taylor Swift concert! Each one of them are incredible human beings and I love knowing them, each one sprinkling their own little essences all over my life (there will 100% probably be a post coming up about friendships)! I used to get upset or even quite offended if my friends didn’t talk to me for a couple of days, then that turned to weeks and now, with most graduating uni, having jobs, and just generally ‘doing life’, it’s harder than ever to meet up as often as we once did or even to drop each other messages and for a while, I was quite upset about it all and felt like we were no longer going to be friends, but this past year alone has taught me that months could go by with no contact and my friends will still continue to be my friends, no matter what. 4. Stop putting pressure on ‘finding your tribe’. Again, there will be a future post about this later on but for now I’ve only very recently learnt that it’s okay to not have a ‘tribe’ of friends that do absolutely everything with each other. I am lucky enough to have a sort of ‘grouping’ shall we call it, of fellow females in my life. However, I’ve also recently learnt that friendships aren’t made to be ridged, they are made to flow naturally. One season I will be closer to some than others and that’s okay because that’s how connections, relationships and people work. I am also proud of the fact I can have many different types of connections with lots of different people. This has taken me at least 2 years to be okay with and not to beat myself up over whose hanging out with who without me but finally I have been able to find a ground of peace. This will 100% be getting it’s whole post because THIS IS INCREDIBLE!!! I’ve always been a pretty spiritual person and have a belief in God and this year has been such a good year in that department! About maybe a year ago I stumbled across a YouTube channel called Raw Alignment. She’s vegan and her attitude to life is crazy contagious! From her, I learnt about veganism (which is interesting but for all those who are wondering, I am NOT a vegan or vegetarian – it’s just good to learn about!) and mindfulness, especially your energy! Stay with me here because I know this is sounding ‘hippy dippy’. From Raw Alignment, I found MuchelleB and have followed her mindfulness videos and OH MY! How they have both changed my life is UNBELIEVABLE! I feel so much calmer, happier and content. I absolutely LOVE reflecting on my day and how I can improve the next. The amount of space I have physically and mentally is so refreshing. Over a year ago, I wouldn’t have thought that I would be ‘one of those people’ that are into minimalism but even just learning about things has been fascinating and I can’t wait to see where it takes me in the next year – or what other new lifestyles I can find! 6. Travelling isn’t as scary as it looks. This year was not only the first time in almost 6 years that I’ve left the country but was the first time I travelled without my parents, who usually knew what they were doing and did everything for me but this time, it was down to me and actually, it wasn’t as scary or stressful as I assumed it would be. I am looking forward to the many more adventures I will go on and am even thinking about going somewhere on my own. 7. I’ve got my whole life ahead of me! I was speaking to one of my friends the other day and she mentioned how she was stressing a little over what she’s going to do after university – which is a completely rational worry! Iin a way, I am too, even though I’m no where near there yet. But if there’s anything I’ve learned this year of being 20, it’s that (I hope) I have another 60+ years on this earth. Another 60+ years to fall in love with places, books, friendships, memories! Of course you should work hard anyway but if someone offers me a spontaneous trip to some distant place I’ve never been before, will I take a week off work?? Erm… yes!! Because there’s so much more to life than ‘what job will I have after uni ends?’! There’s so many things you can do! If I ever find myself deeply unhappy with my life, I hope I have the courage to change it. For the first time in a while, I can’t wait for the year ahead! Not because I have something to look forward to but to be able to look back and see all the lessons learned and how I’ve developed and grown!! What are some major lessons you’ve learnt so far this year? What’s impacted your life in a big way this year? I’d love to be able to spread the wisdom!! Next Tipsy Theatre Reviews ~ The Curious Incident of the Dog in the Night-time! Oh to be you g and having g the world at your feet! Your insight shows true maturity​. Happy (almost) birthday! I totally agree about one of the biggest lessons coming into your twenties is how your friendships start to be redefined. “Stop putting pressure on ‘finding your tribe’” I totally agree. I have found that, often, having 1-2 close friends is better than having a tribe. I’ve never had a tribe and I have gotten by just fine. The whole tribe or girl gang thing is very recent and some people simply don’t have 15 friends and the time or energy to keep up with them all! 😂 Prefer 3 very good friends to 30 people I just happen to know! I agree. I believe that I have two “best friends” – neither of whom actually live by me; One is actually in New Zealand. It takes too much energy to have a big tribe; too many personalities.